As we all know, I’ve got some awesome readers. Often I get emails from readers, telling me about their favorite roll from a sushi restaurant, or a new idea they had for sushi they make at home. This is one such sushi recipe, from a reader named Alex Viera. 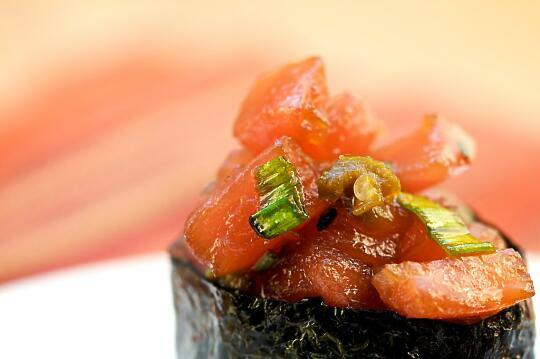 The tuna poke mixture used in this gunkan maki has a very complex yet addictive flavor. It is both sweet and spicy, but still the clean tuna flavor is allowed to shine through. This has a heat that slowly builds until it fills your mouth with fire. At the same time, it is so flavorful that you can’t help but want more. This recipe has definitely earned a place on the list of sushi that I make over and over again – it’s just that good. Slice Tuna into small bite sized pieces. Mix jalapenos, green onions, brown sugar, shoyu, sesame seeds, sesame oil, hot oil, and black pepper in a bowl. Add tuna; gently toss with large spoon. Seal bowl with plastic wrap and refrigerate for one hour. Gently mix/toss again, seal bowl and refrigerate for one more hour. 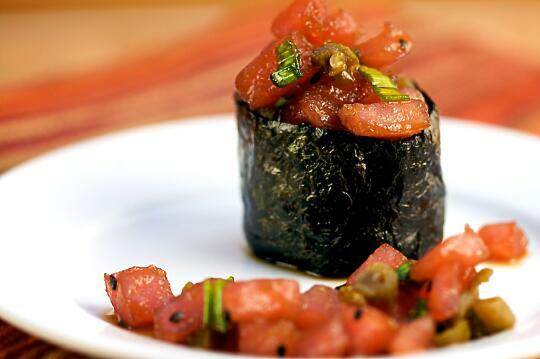 Prepare the gunkan maki, using the tuna poke mixture instead of roe. Very nice. I like poke, and a gunkan maki sounds like a great application. Oh, I thought I won because of my smart, insightful comment. But what the heck..I’ll take the random number generator, too. Friar’s last blog post… I know these things to be true, because Hollywood tells me so. Sorry, must have missed a post but what exactly IS ‘poke’? Nate – I really recommend it. 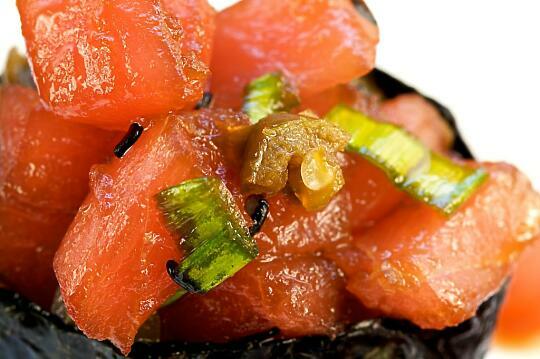 LaraQ – Poke is a Hawaiian-style fish salad, made with cubed raw fish, along with selected sauces or oils (shoyu, etc.) and vegetables (green onion, sometimes tomato, etc.) You can read more about it here if you’re interested. i am looking at the picture and then the ingredients…what is the tannish brownish stuff that appears on the tuna? Thank you for the poke explanation. I’ve yet to make any gunkan style maki (finally made hand rolls on my last sushi making day) but this looks like a good first try especially since I have sourced good sushi grade ahi tuna. I’ve had both salmon and masago gunkan in sushi restaurants but am not that fond of it. Wow, this recepie looks so wonderful. Thanks to Alex Viera for sharing it. Does he have any others? I love Poke, but it’s never occurred to me to put it on sushi. Great idea! Yum! This blog has made me hungry. sounds delicious….nice pictures…wanna try it soon. uphere in U.S. i always have a hard time trying to find ingredients…however, i explored a great site http://www.myethnicworld.com and i thought that i pass great along as well. LaraQ – I have to admit, I’m not so fond of masago or ikura gunkan maki either. But this one is perfect… the tuna poke is SO addictive. Elin – I hope you enjoy the book! Marc – It’s a great combination, I really recommend it! Sampada – Thanks, hopefully you like it. Wonderfull pics, great ideas i’m shy I do so classical sushis, I have many to learn. this great sushi site i love it. i want to give mi recipes to try them. I’m from Bulgaria and we have couples of sushi bars. Tell me when to send some pecipes.